I don’t watch much television, but I do tune in regularly to The Big Bang Theory. The American sitcom follows the lives of four scientists who work at a private research university in California. Many people suspect that Dr. Sheldon Cooper shows several characters of Asperger’s syndrome, such as a lack of social skills, repetitive actions, and attention to detail. Asperger syndrome is a form of autism spectrum disorder (ASD), which does not involve mental development or language delays like classic autism. ASD is known to affect about one in 68 children; however, many adults are also known to live with autism and require additional services. The symptoms of Sheldon and others with ASD may improve with proper nutrition, especially this one vegetable, according to a placebo-controlled, double-blind, randomized study I recently found in the journal Proceedings of the National Academy of Sciences of the United States of America. The researchers made an incredible discovery! The researchers found that a phytochemical derived from broccoli sprout extract, sulforaphane, can improve several symptoms associated with ASD, including communication skills, social interaction, capacity to relate to others, and abnormal behaviors. The study observed 40 boys and young men between the ages of 13 and 27 who had moderate to severe autism. The sulforaphane supplement was randomly distributed to 29 of the participants; depending on their weight, they were given a 50–150-micromole (µmol) dosage for an 18-week period. The others in the study received a placebo. Before the trial, the parents, caregivers, and physicians of the ASD participants completed three standard behavioral assessments, which measured sensory issues and other behaviors associated with autism. The assessment was repeated at the four-week, 10-week, and 18-week marks of the study and four weeks after the conclusion of the sulforaphane treatment. Overall, the results were very impressive. Improvements began after just one month. The sulforaphane supplement lowered abnormal behaviors in 54% of the group. It was also remarkable that 42% of the young men and boys also began verbal communication, and 46% improved their social interactions. They also saw improvements in hyperactivity, awareness, unusual mannerisms, irritability, lethargy, and repetitive movements. However, when the autism patients stopped the treatment, the severity of the symptoms returned. How did the placebo group compare to the sulforaphane group? There was very little or no change during the entire study. So, what made the broccoli sprout extract an effective treatment? How Did the Sulforaphane Improve Symptoms? Sulforaphane is actually able to correct underlying autism-related biochemical concerns on the cellular level of the brain, including mitochondrial function, glutathione synthesis, antioxidant capacity, oxidative stress, neuroinflammation, lipid peroxidation, and oxidative phosphorylation. What was also interesting is that sulforaphane is known to reduce fevers. There were 32 study participants with a history of fevers, and their parents would report symptom improvements after the sulforaphane treatment. Needless to say, the preliminary study is a good starting point for the natural treatment of autism symptoms. There are certain food sensitivities associated with a person with autism, especially gluten and casein (dairy products). Other studies have shown that autism symptoms improve from the elimination of these popular food sensitivities. They may also be sensitive to other foods that are problematic to the brain’s chemistry, such as corn, eggs, soy, or tree nuts. A bio-analysis test can help detect allergies to foods, chemicals, and the environment. The consumption of organic produce and meats can also help reduce the body and brain’s exposure to toxic substances, such as pesticides, herbicides, antibiotics, and growth hormones. Broccoli Sprouts: The Best Natural Ulcer Treatment? “Broccoli-Sprout Extract Shows Promise for Easing Autism Symptoms,” Autism Speaks web site, October 10, 2014; http://www.autismspeaks.org/science/science-news/broccoli-sprout-extract-shows-promise-easing-autism-symptoms, last accessed February 10, 2015. “CDC estimates 1 in 68 children has been identified with autism spectrum disorder,” Centers for Disease Control and Prevention web site, March 27, 2014; http://www.cdc.gov/media/releases/2014/p0327-autism-spectrum-disorder.html, last accessed February 10, 2015. 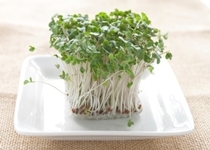 Conrick, T., “Broccoli Sprouts Improve Autism and the Microbiome,” Health Impact News web site, October 29, 2014; http://healthimpactnews.com/2014/broccoli-sprouts-improve-autism-and-the-microbiome/, last accessed February 10, 2015. Murray, M., et al., The Encyclopedia of Natural Medicine (New York: Atria Paperback, 2012), 348–350. Singh, K., et al., “Sulforaphane treatment of autism spectrum disorder (ASD),” Proceedings of the National Academy of Sciences September 4, 2014; 111(43), 15,550–15,555, doi: 10.1073/pnas.1416940111.